This painting is an imaginary depiction of various aspects of my spirit self, making it an unusual self-portrait. The turquoise skin tone evokes a sense of depth and all pervasiveness that we get from the sky and ocean: I find my inner self situated within the core of my mortal body. 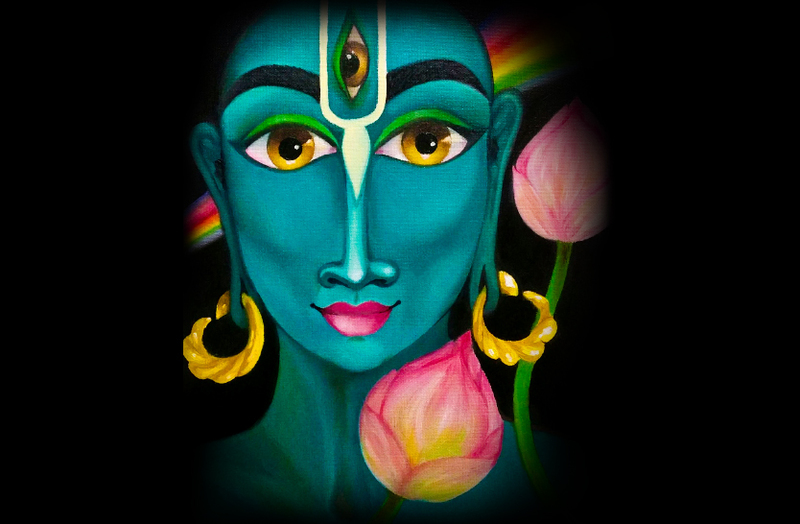 The third eye symbolizes my ability to perceive things that are invisible to the external eyes, signifying the opening of intuitiveness and self-awareness. Lotuses that are yet to bloom symbolize peace, calmness and freshness that I can possess eternally from within. The illuminated rainbow is the complete balance of my energies in my subtle spirit body. I picture myself as a calm, composed and effulgent being, filled with pure energy that is both vibrant and exuberant. Indeed, it is a meditative process that seeks to invoke these positive qualities to manifest from our inner nature to the external physical body. I chose oil as a medium to achieve the desired tones and textures from the blending of various colors. Since there are no limits to creating something from imagination, I exercised full freedom in depicting my inner spirit the way I see it.